One hundred fifteen people died each day in 2018 from an opioid overdose in the United States in 2018, a fact that has brought forth a public health crisis that has affected the whole country. Many resources are being explored on how to battle this issue, and one recent device may save lives — a simple wearable watch that detects overdoses among people addicted to the powerful and deadly opioid painkillers. According to a report from the U.S. Centers for Disease Control and Prevention, the rate of U.S. drug overdose deaths more than tripled between 1999 and 2016. Between those years, fentanyl a synthetic opioid painkiller became responsible for the most significant number of overdose deaths. In 2017, drugs that are mimicked fentanyl accounted for 30,000 deaths among the more than 72,000 estimated drug overdose deaths. The epidemic has sparked numerous companies and university to study possible technological solutions. Experts from the MIT-IBM Watson Al Lab started to use machine learning techniques to analyze patterns in opioid addiction and usage that could change how the prescribing of opioids are handled. The report states the FDA has recently selected eight medical devices from among more than 250 applications for its innovation challenge regarding the opioid issue. The methods range from carefully controlling the dispensing of opioid prescription to decrease the risk of possible addiction. While the other stimulates the brain with magnetic fields to treat opiate addiction or offer other forms of physical therapy and virtual reality therapy. However, one medical device the FDA selected hopes to help detect the early stages of an overdose, just as the HopeBand does. The design developed by Masimo Corporation is more of a monitoring system for a hospital-based setup for people who must be bedridden and take a painkiller after surgery or other medical reasons. That’s what sets apart the Carnegie Mellon University team’s focus on a cheap wearable device to track the health of people wherever they go, just like apple monitors heart rate. Pinney Associates, a pharmaceutical consulting firm approached the students regarding a mobile solution. After they began developing their efforts won them third place in the finals of Robert Wood Johnson Foundation’s Opioid Challenge during the Health 2.0 Conference in Santa Clara, Ca. 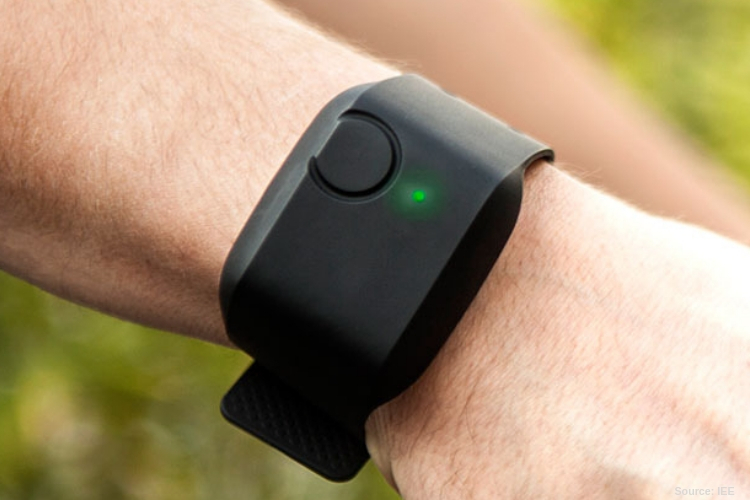 The science behind their invention is based on Pulse oximetry sensors can monitor the oxygen levels in the blood by shining light from LEDs through the skin and detecting changes in the light absorption. When or if the oxygen levels drop below a certain level indicating a possible overdose, the device will monitor the situation for 10 seconds before sounding the alarm Although the team still faces a tough obstacle in validating whether or not the HopeBand works in detecting overdoses with real people. Hopebands will be freely distributed among opioid users through needle exchange programs such as Prevention Point Pittsburgh. If the team’s plans succeed, a commercialized and patented version could eventually begin selling for around $16-$20.